Vanessa Scott and Strattons Hotel of Swaffham are tireless champions of the very best local, fresh, seasonal produce. Vanessa very kindly cooked this recipe for us at our Norfolk Peer new potato season launch in June 2014 and it was absolutely delicious. We are very grateful that Vanessa has allowed us to show this recipe so that you can also try bread made from potatoes. 1. Preheat the oven to 200C/gas mark 8. Line a baking tray with baking parchment. 2. In a large mixing bowl, thoroughly combine the flours, oats, salt & baking powder. Add the grated potato and mix in with the rosemary. Make a well in the centre. 3. Combine the oil, buttermilk and pour into the dry ingredients. 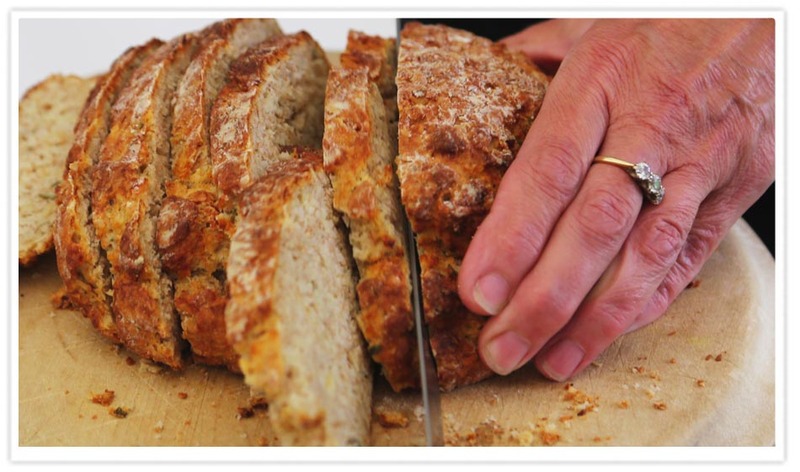 The next stage is the most important part of making good soda bread: the less you handle the mixture, the lighter and tastier the loaf will be. 'Feather' your hand out like a giant fork and gently combine the ingredients. This should take no more than a minute and the mixture should only just be combined, don't worry that the mix is extremely wet. 4. Put plenty of flour onto your work surface and tip your mixture out onto it. Shape the dough into a round making sure you use plenty of flour to shape your loaf, this will stop it from sticking to your fingers or the work surface. Transfer it to the baking sheet. Bake for 35-40 minutes until golden brown and well risen.